From L: Will Marchetti as Walter 2 (older), Andrew Pastides as Walter 1 (younger), Zoë Winters as Maggie 1 (younger), and Carla Spindt as Maggie 2 (older). Photo Credit: Julie Haber. The challenge then: to create the story of a marriage that goes beyond anything you’ve seen before, drawing you into a level of intimacy that is quite startling. It is a challenge for any playwright to say or show something new about a marriage. Kolvenbach’s approach is highly original and effective. In most plays about a marriage (or any relationship), the focus is on the story: how do the characters function in the world? what happens to them? how are they changed? In “Reel To Reel,” there is virtually nothing to be said about what happens to Maggie and Walter, but rather, the focus is on what happens between them, alone. We never learn, for example, if they have ever had children. We know they have had careers. Maggie, we gather, is a public success as an artist with many colleagues and admirers and a career that involves travels to far away places, but we learn almost nothing of that life. Walter had ambitions to make movies. The play pretty is a series of intimate domestic scenes about very little: where will we go for dinner? What do you like best about me? Do you remember when? 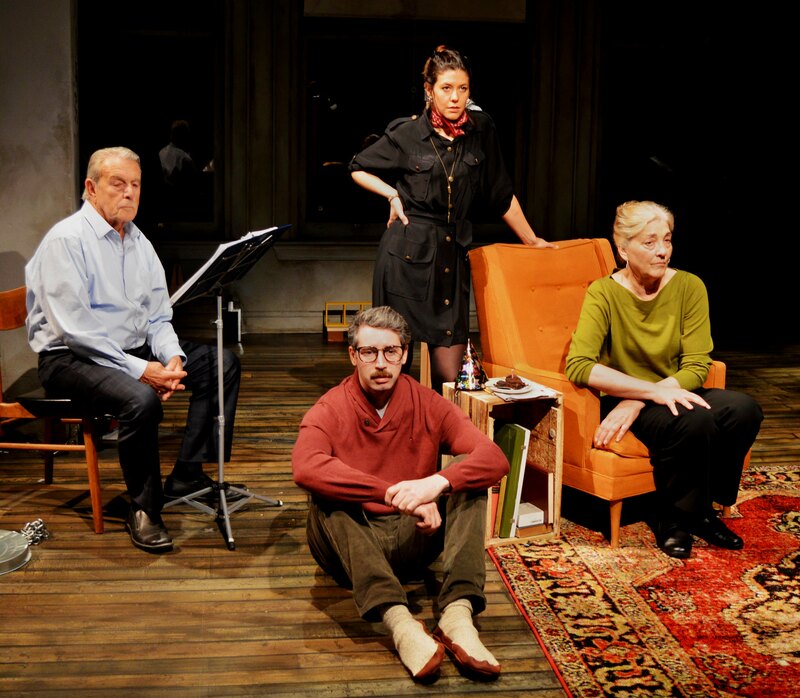 To tell this story, Kolvenbach has come up with a remarkable and effective conceit: There are four actors on stage playing a single couple simultaneously. Sometimes, an older actor is matched with the younger partner, sometimes not. It doesn’t matter: they are the same person. The effect is that we seem to be looking at this long marriage as a single moment as well as a single person.We encounter this marriage all at once, outside time. This is very difficult to describe. The effect is to bring us inside the relationship to an almost uncanny degree. The success of this piece depends upon what can only be described as a miracle of casting: without any doubt, the older and younger actors appear to be the same person, physically, emotionally, vocally, in every detail. The result is far more convincing, I suspect, then a single actor could achieve with makeup and physical imitation, no matter how skillful. Rarely does one see actors achieve this level of empathy. If ever a company deserves an award for ensemble work, this one does! (They are: Will Marchetti, Andrew Pastides, Zoë Winters, and Carla Spindt. There is not much of a story to tell. There is little suspense. We know how it all ends. It is like meeting a person you instantly, really, really like, and spending a few hours of pleasant companionship. “Reel to Reel” plays at Magic Theatre through February 25th. For further information, click here. “Reel To Reel,” written and directed by John Kolvenbach. Produced by Magic Theatre. Set & Projection Design: Erik Flatmo.Costume Design: Meg Neville. Lighting Design: Wen-Ling Liao. Foley Design: Sara Huddleston. Props Design: Tatjana Jessee. Cast: Maggie 1: Zoë Witners. Walter 1: Andrew Pastides. Maggie 2: Carla Spindt. Walter 2: Will Marchetti.